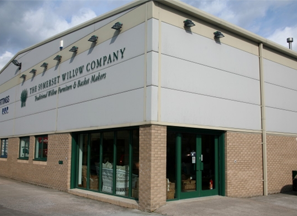 Somerset Willow England, founded in 1959, and under the same principles which still exist today, we have emerged as the UK's leading basket manufacturer. Quality, innovation and a first class service have all contributed to our success over the years. Leading the way in the development of distinctive fashionable willow products, we have the ability to spot market trends and niche potential. 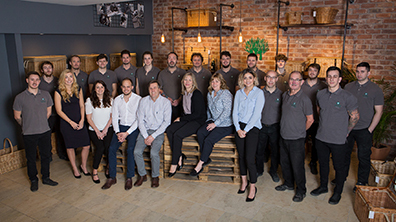 Notably we were the first company to start manufacturing willow coffins in 1998, and to this day we are the UK’s largest willow coffin manufacturer. We have developed a renowned and respected range of willow conservatory furniture and are one of the world’s largest hot air balloon basket manufacturers. Our range of willow baskets and furniture are some of the most exclusive and sought after. 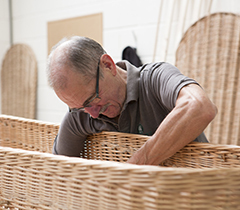 Every basket we make is made exclusively by hand in our workshops in Somerset using locally grown Somerset willow. Unmatched in quality and appearance, we like to regard our baskets as being some of the finest in the world. Innovation isn’t the only key ingredient that we pride ourselves on, as a fourth generation family run business, we understand the important values that customers expect and will always go that extra mile to make sure that our products and services are unrivalled. Loyalty, passion and attention to detail form the foundation of our never ending commitment. Traditional at heart yet contemporary in vision, we’re always looking to the future and glancing back at the same time, to remember the values and beliefs that have brought us to the point we stand today. Enjoying our fourth generation of business, the company is presently being lead and directed by the Hill family’s third generation ‘Darrell Hill’. Traditionally taught and trained and with over 35 years of experience, Darrell’s thorough understanding and knowledge of basket design and construction have made him one the country’s most elite master craftsman. Taught by his father Aubrey who was the second generation of the business, Darrell spent five years as an apprentice before coaxing his skills onto some of the most spectacular pieces to have ever been crafted. Today, Darrell likes to lead from the front and is passing his aged honed skills onto some of our newest apprentices. Supporting Darrell is Anthony, Darrell’s son and fourth generation of the company. Anthony initially started his basket making apprenticeship in 2004 where he finished honing his skills from his father Darrell and Granddad Aubrey just before his Granddad’s retirement in 2008. Since then Anthony has very much become the driving force behind business development and has spearheaded some of the biggest changes in the company including the setup and operation of the company’s subsidiary Natural Woven Products. The company is still very much a family run business with ‘Karen’ Darrell’s sister running the accounts and Heidi Hill, Darrell’s wife, working on the marketing area of the business. The company presently employs 20 key staff of which 15 are trained willow craftsman. 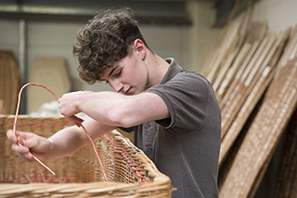 Each new willow craftsman apprentice must complete a stringent five year training programme before they are deemed capable of crafting the company’s product range.